My mom, son and I headed to Colorado Saturday for our "ski" trip. Before heading to the mountains, we swung by my cousin's house for a visit. He has a really cool house in a very cool neighborhood. We walked to a sandwich shop for lunch and managed to talk a little about training. He's a 2x Ironman and I'm an Ironman wannabe, so it was nice to talk shop and hear about his training. Maybe someday we can do an Ironman together. 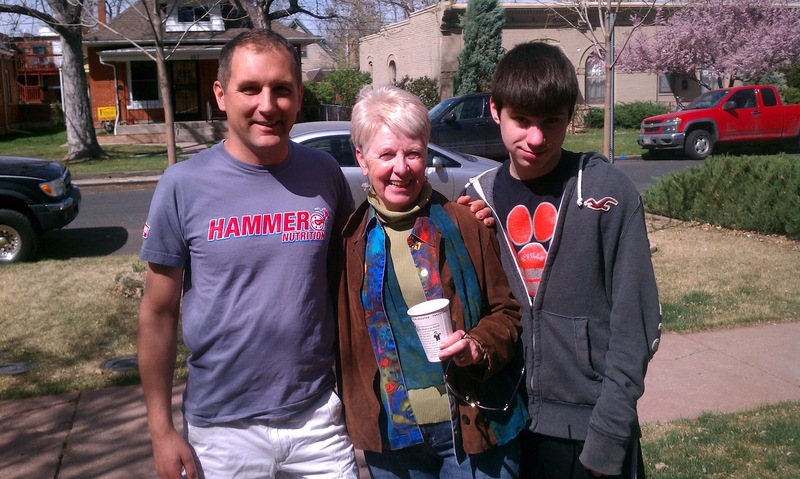 My cousin, mom, and son. I had been watching the weather in Breckenridge for a couple weeks and knew it had been warm for several weeks. I didn't know they had their driest March on record. My mom asked if I wanted to cancel the trip and I was quick to say no thanks. The fresh air and mountain views would be nice, even if we couldn't ski. It was 60 degrees Sunday, so I talked my son into going for a little hike. We didn't bring don't have hiking gear, so we borrowed a couple back packs and made due. 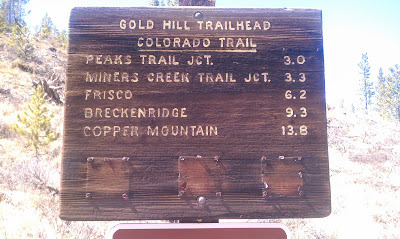 The Gold Hill trail head is about 3 minutes from where we are staying, so we headed over there late morning. We headed up the trail. It was steep by our mid-western standards and with the starting altitude of 9,200' and peak altitude of 10,200', it was a good workout to say the least. 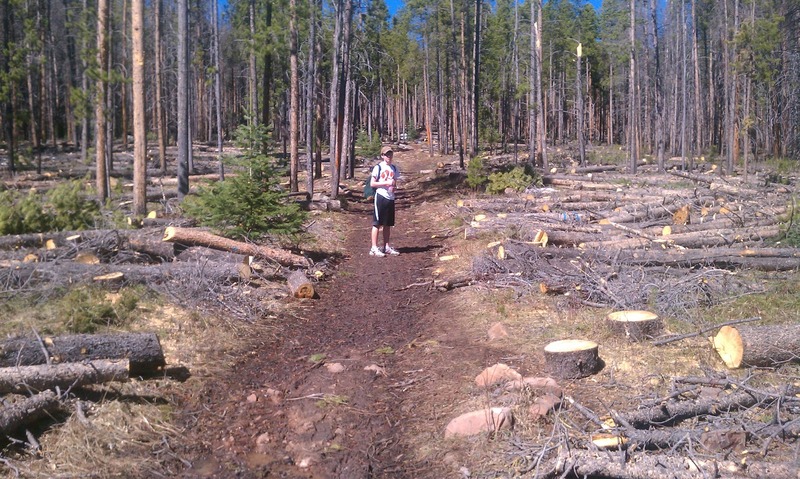 Colorado has a problem with pine beetles killing the trees. 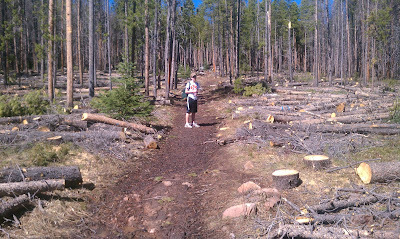 They are then really susceptible to forest fires, so this area had a bunch of freshly cut diseased trees. Kind of sad. 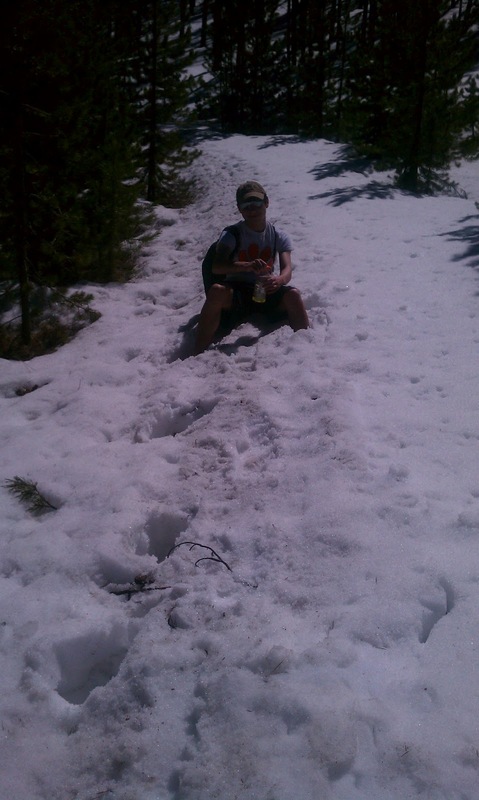 We continued up the trail taking in the beauty of Colorado and eventually ran into some snow. 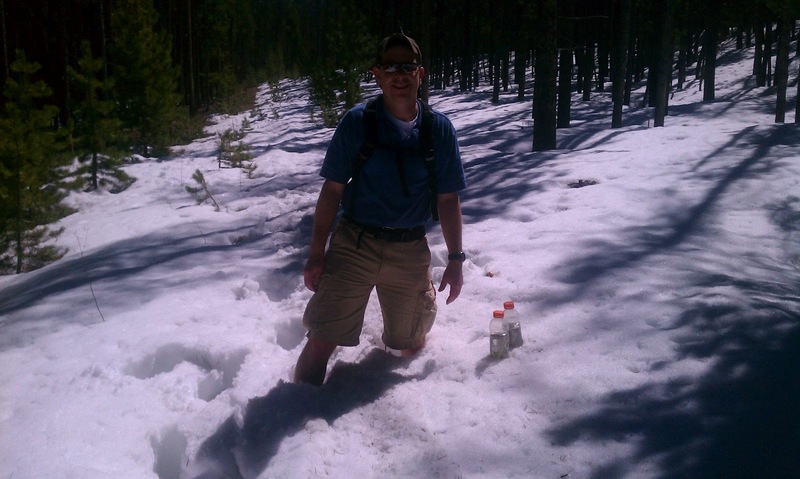 We continued on, though we started breaking through the snow pack at some points making for tough going..
Just about to the snow. When one leg would break through the snow up to about our knee, it was like doing a one leg squat to get out :-). When both legs would fall through, it was inconvenient but funny. My son fell through and asked for help and I said "sure, just let me snap a couple of pics first" :-). 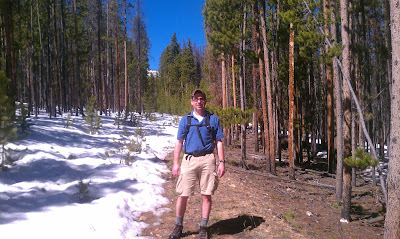 We had a great hike and I could see making a vacation around hiking and back packing in the future. I asked my son if he liked hiking or skiing better and he said skiing because you go faster :-). Oh well, I'll keep working on him. I'll share some skiing pics in my next post. As you well know, I LOVE Colorado :). Next time, you'll have to let me know - would love to have met up with ya! What fun! Love the pictures, though the lack of trees is sad. Thats awesome. 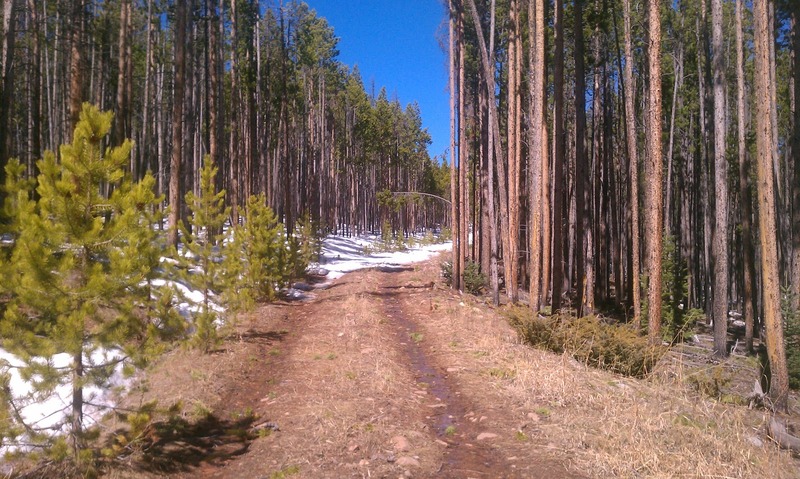 I love that there was some snow on the trail but yet a nice sunny "shorts" day. Looks fun! I love to hike but I have very few opportunities to do so. Love that you took pics before helping. Now that's a blogger. Looks like a fun day. That looks like loads of fun. I LOVED that you totally took embarrassing pictures before helping him. That is the sign of an AWESOME parent right there! But what a great day with your kid. Glad you're enjoying the same great weather we had! 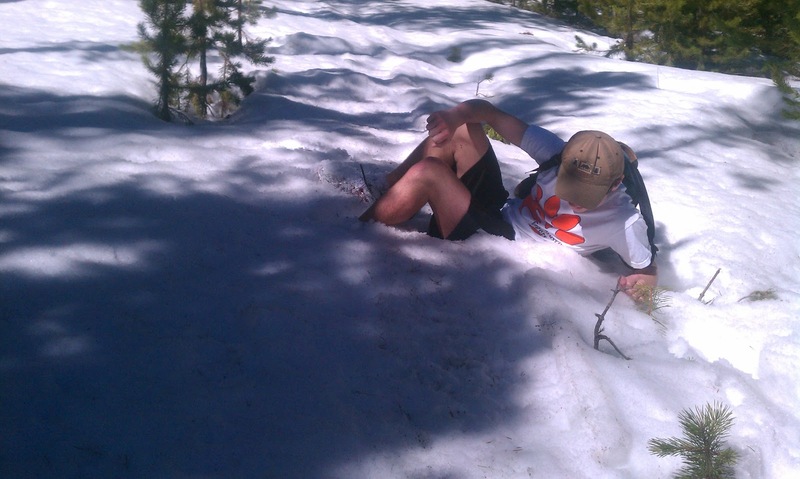 Ah, springtime in the Rockies - you never know what you're going to get ... or is that like a box of chocolates?? 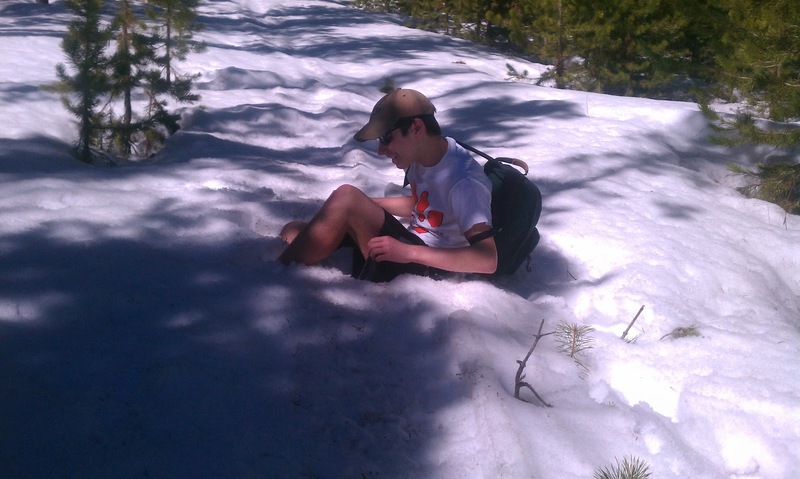 Glad you're getting some hikes in since the snow has been so-so! When are you gonna COMPLETE The Colorado Trail..? After this great trip, you probably have only 484 miles to go!! Contact us for info if you'd like: ColoradoTrail.dot.org. Lovely pics, Mike. DANG that is so high. I would have been wheezing. Beautiful though! Another great post, I love the hiking in shorts. Simply awesome! 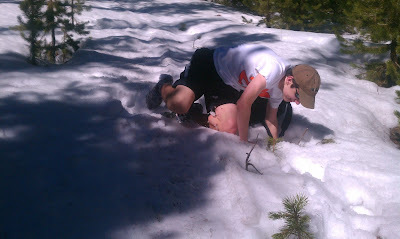 I hate falling through the snow! Last year I went for a run on a snow day - LOVED IT - but then was afraid I wouldn't get back through my yard to my house the snow was so deep and I just kept sinking! Looks like a fun time with your son though. The snow breaking sequence is great! What a fun trip! 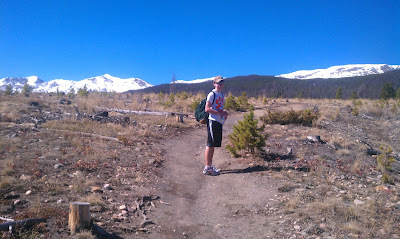 I was in Breck 2 summers for a half marathon. A oxygen deprived one!